In the back yard. Less than 100 yards from the kitchen window where I took this really awful picture, but I rushed it hoping he wouldn’t fly away. Which he did, about 10 seconds after the picture. The crows went nuts and he flew down the side of the property and hung around for a few minutes high in my neighbor’s tree. 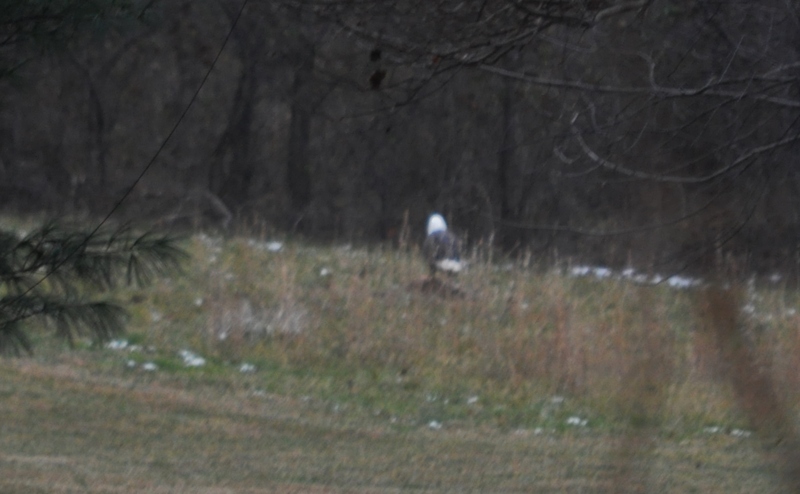 Then, tired of the crows circling and yammering at him, he headed off back towards Triadelphia Reservoir. What brought him here? The dead deer out there. Probably a car-deer casualty. Which is now mostly hide, hoofs, head and chest cavity. The third one we know of, in our almost ten years here. Usually, we only know about them because of the turkey vultures. But this morning at 7 am, my husband yelled up the stairs. EAGLE!!! In the back yard. I’ll have to get up early tomorrow and see if he’s returned. Just another Saturday in the rural western part of our little Central Maryland county. Posted in Birds, Howard County, Nature, West HoCo and tagged birds, community, eagles, Howard County, nature, photography, West HoCo. Bookmark the permalink.